Each week of Lent, First Grace will be given one of the “Ministries of Life Together” that Rev. Dietrich Bonhoeffer wrote for his flock. We are invited to read, reflect and practicethe ministry for the week in all aspects of daily life. Perhaps you will add to the ministries that Bonhoeffer wrote of. He spoke of the Ministry of Listening, The Ministry of Holding One’s Tongue, The Ministry of Meekness, The Ministry of Helpfulness, The Ministry of Bearing the Burden of Each Other, and the Ministry of Proclamation-Speaking the Truth in Love. DIETRICH BONHOEFFER was a German pastor and theologian known for his opposition to National Socialism-Nazism and Adolf Hitler. His ties to the July 20, 1944 conspiracy to assassinate Adolf Hitler and to overthrow the Nazi regime led to his arrest. In April 1945, weeks before the war ended, Bonhoeffer was hanged. His theological writings are regarded as classics throughout the Christian world. One of those writings is Life Together-a Discussion on Christian Fellowship. Bonhoeffer had opened an underground seminary where he served as dean. He wrote Life Together for the seminarians who were having a difficult time-living together and being the church for each other. 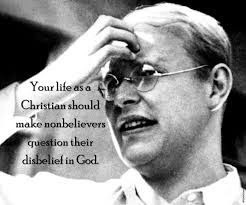 Bonhoeffer was engaged in a most serious, dangerous and joyful life-giving endeavor-living the Gospel of Jesus Christ. For him and for us the gospel is one of both social transformation AND personal transformation. These two transformations do not happen in unison. Bonhoeffer confronted the ills in society and the ills in himself. His faith as a disciple of Jesus Christ enabled him to do both. Like the first disciples of Jesus, he was silenced, imprisoned and executed. Yet Bonhoeffer was known roundly as the kindest and most generous of souls. He even provided pastoral counseling for his Nazi prison guards. He is truly among the cloud of witnesses. THE SECOND SERVICE that one should perform for another in a Christian Community is that of active helpfulness. This means, initially, simple assistance in trifling, external matters. There is a multitude of these things wherever people live together. Nobody is too good for the meanest service. WE MUST BE READY to allow ourselves to be interrupted by God. God will be constantly crossing our paths and canceling our plans by sending us people with claims and petitions. We may pass them by, preoccupied with our more important tasks, as in the Good Samaritan story when the priest passed by the man who had fallen among thieves, perhaps—reading the Bible. IT IS A STRANGE fact that Christians and even ministers frequently consider their work so important and urgent that they will allow nothing to disturb them. They think they are doing God a service in this, but actually they are disdaining God’s “crooked yet narrow path.” They do not want a life that is crossed and balked. But it is part of the discipline of humility that we must not spare our hand where it can perform a service and that we do not assume that our schedule is our own to manage, but allow it to be arranged by God. Only where hands are not too good for deeds of love and mercy in everyday helpfulness can the mouth joyfully and convincingly proclaim the message of God’s love and mercy. And from Community And Growth by Jean Vanier. In his 20s Jean Vanier left the navy as a captain, in his 30s left the university as a professor of philosophy and has lived with the mentally and physically disabled for more than 50 years. He is the founder of L’Arche Communities. SOME COMMUNITIES START BY SERVING THE POOR. When they begin, their members are full of generosity-though sometimes a bit aggressive toward the rich-and have rather utopian ideals. Gradually, they discover the need for prayer and an inner life, they realize that their generosity is being burned up and that they are in danger of becoming a collection of hyperactives who put all their energy into external things… If this group does not grow into discovering the deepening of prayer and the bonds of love flowing into celebration, they risk becoming a militant group struggling for justice. OTHER COMMUNITIES START WITH PRAYER-like many of the communities of (the praise and worship} and charismatic movement. But gradually they discover the need to serve the poor and to develop a real commitment to them…… If this group does not discover the waters of compassion flowing from the pain of the poor and others, they risk becoming legalistic and sterile. …Opening to God in adoration and opening to the poor in welcome and service are the two poles of a community’s growth, and signs of its health. And the community itself must grow towards a stronger sense of its own identity…a body in which every member can exercise their gift and be recognize for it.